by Lifeboat Foundation Scientific Advisory Board member John Leslie, 1999. Of all humans so far, roughly ten per cent are alive with you and me. If human extinction occurred soon, our position in population history would have been fairly ordinary. But if, in contrast, humankind survived for many more centuries, perhaps colonizing the galaxy, then we could easily be among the earliest 0.001 per cent of all humans who will ever have lived. This could seem a very surprising position to be in  a point which is crucial to a “doomsday argument” originated by the cosmologist Brandon Carter. People who accept the argument, even in a weakened form which takes account of the fact that the world is probably indeterministic, will re-estimate the size of the threats to humankind, showing increased reluctance to believe that humans will survive for very long. Possible threats include nuclear and biological warfare; ozone layer destruction; greenhouse warming of a runaway kind; an environmental crisis caused by overpopulation; new diseases; disasters from genetic engineering or from nanotechnology; computers replacing humans entirely, as some people think would be desirable; the upsetting of a space-filling scalar field through an experiment at very high energies, as discussed in a recent book by England’s Astronomer Royal; and even the arguments of the many philosophers who see no duty to keep the human race in existence. But despite all such dangers and despite Carter’s disturbing argument, humans may well have a good chance of surviving the next five centuries. What chance has the human race of surviving the coming century, and perhaps further centuries? Comets and asteroids are very unlikely to exterminate us. 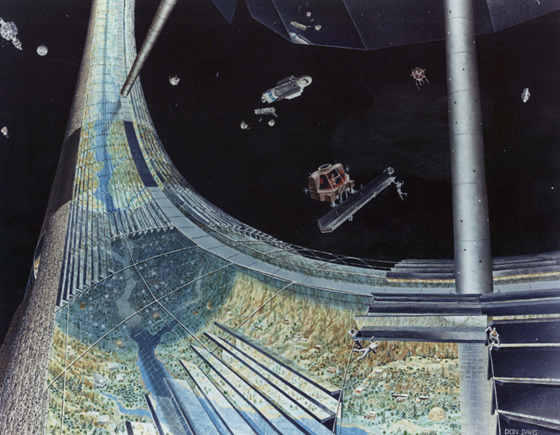 During the next hundred years Earth may well be hit by something large enough to wipe out a city, or several cities if the thing hits an ocean, producing huge tidal waves. Yet even something much bigger, like the monster which exterminated the dinosaurs, probably would not be enough to kill all humans, and objects of that size arrive only about once in a hundred million years. Long before the next one did, humans should have spread far beyond their tiny planet so long as they had not exterminated themselves. How likely are they to do that? Let us look at various risks. First, there is nuclear warfare. There are still thousands of hydrogen bombs despite the collapse of the Soviet Union. Because of the chaos of its collapse, the threat of accidental nuclear war could well be greater than ever. Nitrogen oxides from a nuclear war might be disastrous to the ozone layer, Earth’s shield against ultraviolet light. Also, nobody can be sure whether a “nuclear winter”, severe cooling which lasted for months, would result from all the soot which burning cities and forests threw into the atmosphere. The radioactive fall out would work mischief too. Humans might be wiped out through the deaths of microorganisms which were crucial to the health of the biosphere. Biological warfare could be still more dangerous. Scientists could produce new diseases that spread more easily and killed far more efficiently than the Spanish ‘flu which, appearing in 1918, ended more lives than the World War had just done. An aggressor nation’s vaccines to protect itself could fail, in which case maybe everybody could be killed off. Do not say that nobody would be criminal enough to risk it! The world contains some very unpleasant individuals and, now that mammalian cells can be grown on tiny beads, a single bottle can produce viruses in numbers which previously required large factories. It is often population pressures which lead to warfare, and the world’s population is still exploding. We have some six billion humans now, which means only very little usable land for each. There could be up to twelve billion humans by the end of the next century. Even without warfare, the environment could come under disastrous pressure. Many think it already is, thanks to such things as the unholy alliance between fertilizers and pesticides, the loss of forests, and the chlorofluorocarbons which continue to erode the ozone layer. Scenarios involving positive feedback and runaway overheating are easy to construct. For instance: (i) Ocean waters warm up, becoming less able to absorb carbon dioxide which is a powerful greenhouse gas; (ii) cold-water nutrients then rise to the warmed sea surface less often, so phytoplankton grow more slowly, absorb less carbon dioxide, and generate less dimethyl sulphide, a substance which encourages the birth of the clouds which keep us cool in daytime; (iii) many phytoplankton die because of ozone layer losses; (iv) warmer weather increases production of carbon dioxide by plants and soil microbes; (v) tundra melts and peat bogs dry out, producing yet more carbon dioxide and vast amounts of another greenhouse gas, methane, which is, molecule for molecule, perhaps thirty times as powerful; (vi) changes in high altitude clouds make them trap more heat; (vii) drought then kills vegetation, returning carbon dioxide to the atmosphere; (viii) there next comes depletion, through the ravages of methane and other greenhouse gases, of the hydroxyls which are so important in destroying these gases; (ix) there follows a retreat of sea ice, so that less sunlight is reflected back into space; (x) heating of the sea thereupon releases the trillions of tons of methane which are at present locked up in the clathrates of the continental shelves; (xi) the new heat produces much more water vapor, an extremely important greenhouse gas, so that a greenhouse-effect disaster arrives. James Lovelock is well known for his “Gaia” hypothesis which, stripped of the mysticism that has sometimes been attached to it, is simply that negative feedback loops have kept Earth healthy. However, he has recently been saying that positive feedbacks could come to be dominant any day now, the planet’s temperature then perhaps rocketing upwards in a way producing “gigadeath”: killing billions, that is to say, if not everybody. Even without severe heating, the environment could suffer heavily through industrial pollution, pesticides, and deliberate destruction of habitats. Nobody knows whether this would be ruinous. Again, consider the concentration of so many people in huge cities, international travel, and the weakening of our immune systems through onslaughts from the eighty thousand chemicals which are synthesized today on an industrial scale. These factors could combine to produce worldwide plagues of startling killing power. It is nowadays often suggested that the AIDS virus had been around for a long time, unable to spread widely because twentieth-century civilization had not arrived. An expert on global risks, Norman Myers, has estimated that it may now destroy up to one in five of us. Perhaps, though, we can count ourselves lucky that it is not still more threatening. The closely related visna virus, which infects sheep, is spread simply by coughing. Before continuing this catalogue of possible disasters, let me mention that my recent book in the area , although it bears the potentially alarming title The End of the World: The Science and Ethics of Human Extinction, is actually fairly optimistic. The human race seems bound to end sooner or later, but the book gives it a good chance  perhaps as high, I suggested, as seventy per cent  of surviving the next five centuries. If it did, then it would be quite likely to spread right across its galaxy. All the same, humanity’s future prospects are markedly uncertain. The next couple of centuries will probably be the period of highest risk. When thinking about them, remember Enrico Fermi’s question of why we have not detected any extraterrestrials. Calculations suggest that a species which had developed industrial technology could spread across its galaxy in a few million years. Now, our galaxy has existed for several billion years, and it contains many billion sun like stars. Even if only a small proportion of those stars have suitable planets, how comes it that not a single planet has given birth to intelligent beings who have spread far enough for us to notice? One currently popular answer is that intelligent species do appear quite often, but that they then quickly destroy themselves through their scientific discoveries. Our own latest discovery, genetic engineering, has alarmed many people. Most experts say that its risks are fairly small, but social pressures might be influencing them. Instead of just affecting industry, as in the case of regulations applying to nuclear power plants, efforts to restrict genetic engineering threaten the salaries and research grants of numerous scientists. I confess that I lose little sleep from fear of the so called “green scum disaster” in which a genetically engineered super organism performs so efficiently that it wipes out everything else, yet maybe not even this can be entirely ruled out. And it was rather a shock to find Toronto’s The Globe and Mail reporting on November 2nd 1993, on its front page yet with no mention at all of possible risks, that researchers at Washington University had used genetically modified salmonella bacteria to produce harmless, temporary infections able to act as contraceptives, rendering recipient women infertile for months. Are not salmonella bacteria extremely widespread, and might not the genetically modified ones mutate so that they spread efficiently from woman to woman? What might that not do to humanity’s survival prospects? Bear in mind, too, that genetic engineers could develop truly terrible germ warfare agents. The greatest threat during the coming century could easily be from these, perhaps let loose by terrorists. An exotic variant on the “green scum disaster” is the “grey goo calamity” which nanotechnology might conceivably make possible. Nanotechnology, originally suggested by Richard Feynman, is the development of very, very tiny machines, preferably controlled by their own miniature computers. Such machines might be made self-reproducing. After all, viruses and bacteria can be viewed as “natural machines” and they reproduce themselves with ease. If it used sunlight as its power source, and naturally available chemicals, self reproducing nanomachinery might perhaps reduce the biosphere to dust. I think nothing of the sort will be possible for at least another three or four centuries, yet it is very hard to be sure. Computers could become threatening rather more quickly than that. Already, humans are strikingly dependent on them. The “year two thousand problem”  the fact that many computers will fail at the opening of the next century, which their internal clocks will be unable to handle  may result in economic chaos. And people have suggested that something a lot grimmer could hit us later, as nation states handed over more and more of their decision making to computers of ever greater intelligence. The most powerful nation states, the ones which won the struggle to survive, could be those whose computers were programmed simply to defeat other nation-states economically. They might have few citizens, almost everything being done by machine. A conceivable final outcome would be that computers replaced humans entirely. On some versions of this scenario, the computers take over through developing enough cunning to defeat us when we try to interfere with them. On other versions, they take over with our full blessing. Hans Moravec, a leading expert on artificial intelligence, states in his book Mind Children  that he believes the human race to be in its final hundred years, and that he intends to work for its speedy extinction. Computers, he argues, will soon be far cleverer than humans. They will be virtually immortal. Their thought processes will be much less neurotic. In a word, they will be better, happier beings than we are, and we should be eager to have them replace us. Moravec here assumes that, as well as being highly intelligent, computers could be fully conscious. Many philosophers would agree with this, yet many other philosophers would not. It is a difficult issue. Another such issue is whether physicists could destroy the world by experiments at extremely high energies. There has been some discussion of this in the journals. The energies available to experimental physics have increased roughly tenfold in each decade since 1900. In his book Dreams of a Final Theory  the Nobel-prizewinning physicist Steven Weinberg suggests that, using lasers to accelerate atomic particles, even Planck scale energies might be had. A collision between two particles at Planck-scale energies could release into a very tiny volume the power of two small jet aircraft colliding head-on. Now, we know that very high kinetic energies are reached by cosmic rays, particles which can sometimes pack the punch of bullets, but the energies of collisions between these rays, at least inside “our past light cone” (which means the section of the universe’s history which is relevant to us), are thought to have been well below those of bullets in collision. Could disaster strike if physicists exceeded cosmic ray collision energies, which would seem to be the very highest energies known to be safe? According to most physicists, what we think of as “empty space” is in fact filled with one or more force fields  “scalar fields”  whose presence is vital to the world as we know it. Perhaps as early as in the coming century (although this can seem very unlikely) experimenters could reach energies above those of the colliding cosmic rays. They might then conceivably produce a tiny bubble of new-strength scalar field, a bubble of an “energetically advantageous” sort. Such a bubble would expand through the surrounding space rather like a rock rushing downhill, but much faster: at virtually the speed of light, in fact. The solar system would be destroyed, and then our entire galaxy, and so on. The bubble would just keep expanding. A possible ground for taking such warnings seriously is the “doomsday argument” originated by the cosmologist Brandon Carter, an argument which has now been developed and defended by several people, including Richard Gott. I have defended it myself , trying to refute a large number of objections which people have thrown at it. Suppose that many thousand intelligent races, of more or less the same size, had been more or less bound to evolve in our universe. We could not at all expect to be in the very earliest race, could we? Now, very similarly, you and I could not expect to find ourselves among the very first  for instance, in the first one per cent  of all humans who will ever have existed. That, however, is where you and I would be, if the human race were indeed going to last for many more centuries, even at just its present size. If it spread right across the galaxy, then you and I could easily be in the first thousandth of one per cent. But if, in contrast, humans became extinct shortly, then you and I would have lived at the same time as up to ten per cent of all humans ever. Remember that, of all humans so far, maybe seven or eight per cent are alive at this very moment. Quite a useful principle of scientific reasoning runs as follows. Avoid treating what you observe as very extraordinary, so long as you can instead fairly easily regard it as fairly ordinary. Now, how about your own observed position in human population history? To regard it as fairly ordinary rather than highly extraordinary, all you need do is to think that humans will fairly soon be extinct. Imagine a scene towards the end of the next century. 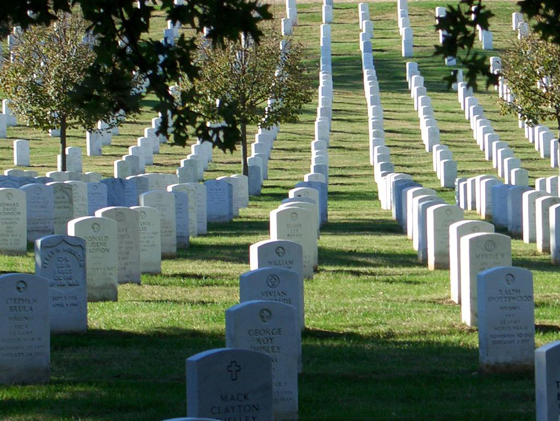 Ten billion humans walk the Earth, but all will die inside a month because of germ warfare. One of the doomed humans complains of his terrible luck in having been born so late. “There have been”, he complains, “upward of fifteen thousand generations since the start of human history, yet here I am in the very last generation, the one which gets wiped out by the progress of military science. What fantastically extraordinary ill fortune!”  Well, would not this be absurd? Perhaps ten per cent of all the humans who would ever have been born would be alive at that very moment. How could it be “fantastically extraordinary” to find yourself in company with ten per cent of all humans? Here is another way of looking at the matter. Suppose that in our gigantic universe  over a hundred billion galaxies  intelligent life is bound to evolve many times. If intelligent species found it easy to survive long enough to start spreading through their galaxies, then would not almost all intelligent beings live at times when their races had spread through their galaxies, since at those times the races in question would have so immensely many people in them? But do you and I find ourselves in a race which has spread through its galaxy? We do not. If intelligent life will span the universe living for trillions of years, what are the odds that we would be part of the 0.00000000001 per cent of intelligent life that is stuck living on just one rock instead of being part of an interstellar civilization? People often protest that we have to find ourselves alive at the time when we do, since it is that time now. If now is a time before the human race has spread through its galaxy, then so what? Finding ourselves alive when we do cannot, they say, be any indication that there will not be trillions of humans later. It is absurd, their protest runs, to ask what period you could expect to have been born into, against the background of this or that story about how humans are distributed across the ages. “When you could expect to have been born” is a nonsensical notion. But any protest on these lines is simply wrong, I think. Suppose you have forgotten your birthday. Is it likely to have been March 21st? No, for only relatively few humans have March 21st as their birthdays. Think about lemmings. If you were a lemming, when could you expect to have been born: at a time when there were hardly any lemmings, or after a lemming population explosion? According to the cosmologist I mentioned, Brandon Carter, reflections on these lines ought to increase any doubts which we had about a long future for humankind, a future containing perhaps many trillions of humans in different parts of the galaxy. This is what has come to be known as Carter’s “doomsday argument”. After looking at the dangers confronting the human race, but before considering Carter’s argument, I would have guessed that humans had only about a five per cent chance of becoming extinct during the next few centuries, and perhaps a ninety per cent chance of spreading across the galaxy. Now that I have taken Carter’s argument into account, what is my estimate of the chance that humans will be extinct within a few centuries? Answer: about thirty per cent. So you could say that Carter’s reasoning has made me about six times more pessimistic. However, I have reservations about the variant on this reasoning which was arrived at, quite independently, by Richard Gott . If I understand him rightly, Gott reasons that your chance and mine of being in, for instance, the first 2.5 per cent of all humans who will ever have lived is 2.5 per cent, and that is that. He points out that if, when the human race came to an end, all humans had always guessed that they lived in the first 2.5 per cent, then exactly 2.5 per cent would have guessed correctly. I suspect that his argument is too straightforward. We have evidence of actual risks facing the human race, and of actual attempts to counter those risks by, for instance, trying to prevent disgusting tyrants from developing biological weaponry. This is evidence which we should not disregard. I discussed the point with Carter, and what we concluded is that the doomsday argument is best used simply as a magnifying glass, increasing whatever pessimism we had developed after thinking about disgusting tyrants, the ozone layer, greenhouse warming, nuclear bombs, etcetera. Suppose that thinking about these things still left us extremely confident in a long future for humankind. In that case the doomsday argument, although reducing our confidence, could still fail to remove it. Pessimism which starts off extremely small can remain small even when magnified. Another point on which Gott and I may disagree is this. I think the doomsday argument works in a smooth mathematical way only if our world is a deterministic world, a world in which the number of humans who will ever have lived is something which has already been fixed: something “already out there” in the realm of genuine facts. In that case your situation and mine could be compared to that of a man drawing names from a hat. He knows that his name was in the hat only once, and that the hat contained either sixteen names or else six hundred. He has just drawn his name, and it was the seventh to be drawn. He now asks how likely it is that the hat contained six hundred names. He ought to take into account two things: first, how confident he used to be, before he started drawing names from the hat, that it contained six hundred names, and second, the fact that his name was the seventh to be drawn, which would have been less remarkable if there were sixteen names instead. A mathematical formula known as Bayes’ Rule can tell him what he should now think. But this mathematical formula works unproblematically only because the number of names in the hat was, all along, something “already there”. The future of the human race, you might reasonably believe, is not “already there” in the requisite way. The number of humans who will ever have lived may depend, for example, on whether some politician is going to push a nuclear warfare button. Whether this politician will push the button may depend on some utterly free decision which the politician has not yet made, or perhaps on some utterly random quantum event which will occur in his or her brain. The right conclusion, I suggest, is that the doomsday argument runs smoothly only as a way of reducing very great confidence in a long future for humans: confidence, in effect, that a long future for humans is already “there” or “as good as there”, in the sense that it is inevitable or very near inevitable. If you lack this sort of confidence, then the argument perhaps ought not to influence you all that much. It is because of this that my own confidence in a long and heavily populated future for humans, a future in which they spread right across the galaxy, can be as high as it is. It stands at a little above fifty per cent. If the doomsday argument worked really smoothly, then my confidence would instead be well below one per cent. People worrying about human extinction have also raised other problems with which philosophers have struggled. The main one is this. If human extinction seemed imminent, then ought we to try to prevent it? For a start, is it ever a fact, in any straightforward sense of the word “fact”, that we ought to do this or that? So called facts about what we ought to do: may not these be simply matters of taste, or of how we order one another around, or of something similar? And next, could it ever be a fact that people who had not been born had a right to be born? Would not these be “merely possible people” so that if they never got to be born  because, perhaps, the human race had been wiped out by biological warfare  then this would not really matter? Which real people would have been harmed? How could the possible people have a right to be indignant about never being born? Merely possible people cannot be indignant, can they? Here let me just comment that, when my book settled down to examining the threats to the human race, threats from faulty philosophy were on the list. I know of no adequate reason for denying that facts about good and bad are as much “out there in the real world” as the fact that two and two make four; and yet, you will find plenty of philosophers who deny it. Again, you will find plenty of philosophers who run the argument that merely possible people are not real people, and that therefore there can be no basic duty to keep the human race in existence. And you will find other philosophers who think that getting rid of the human race would be really rather a good thing, because of all the unhappy humans who would live if the race continued onwards. Even one unhappy human per million would be altogether too much, according to some. You will actually find a few philosophers, for instance Schopenhauer, arguing that virtually every human is more unhappy than happy, so that it would be wonderful if humans could be made extinct. There are all sorts of difficult philosophical points in this area, and it is intellectually right and proper to recognize just how difficult they can get. Still, I urge you not to be persuaded by most of the philosophers who discuss them. If you were, then you could soon find yourself saying that the extinction of all humans would not be tragic. I think it would be. Advanced intelligence, or even just anything worth calling life and consciousness, may arrive in a galaxy only through a great deal of luck. It might actually be that humans are the only intelligent species in our entire universe. If they survived the next century or two, then their descendants would quite probably spread right through the Milky Way and then possibly through other galaxies too. The lives of these descendants could be quite a bit happier than ours, and there could be hundreds of trillions of them. All this might depend on whether a few billion dollars were spent on building artificial refuges, so that a few hundred humans could survive nuclear or biological warfare. Yet almost nobody is interested in building them. 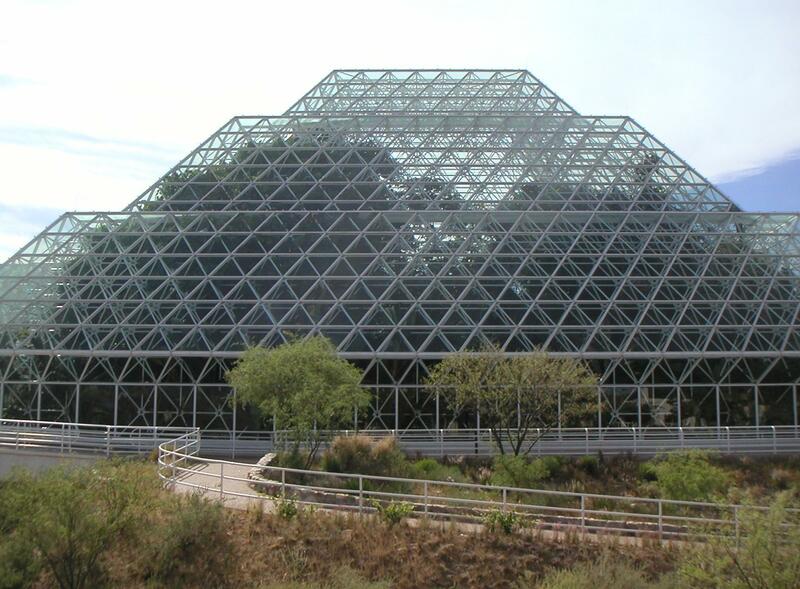 The first major artificial habitat, Biosphere 2, cost only a hundred and fifty million dollars. Designed with the help of some rather sloppy science, it soon failed to be self-sustaining. Since then, nobody has even tried. Meanwhile, the global armaments industry has been swallowing about a thousand billion dollars annually. 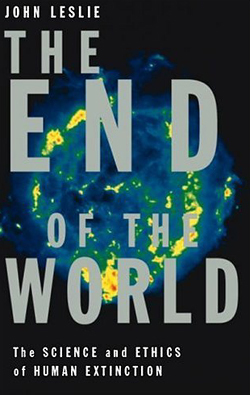 The End of the World: The Science and Ethics of Human Extinction, Routledge: London and New York, 1996 (paperback, expanded, 1998). Mind Children, Harvard University Press: Cambridge, Mass., 1998. Dreams of a Final Theory Hutchinson, London, 1993. See pages 187–188 in particular. How stable is our vacuum?, Nature Vol. 302, 1983, April 7, pages 508–509. Before the Beginning, Addison-Wesley: Reading, Mass., 1997. The quotation is from page 207. See, for instance, Time and the anthropic principle, Mind Vol.101 No.403, July 1992, pages 521–540. Implications of the Copernican principle for our future prospects, Nature Vol. 363, 1993, May 27, pages 315–319.